Industrial designers have made a lot of improvement on our kitchen gadgets. However, there is still some needs for more. But it doesn’t mean we need to throw out our old appliances. There are many creative adds-on which are designed to work with our current gadgets and get better or more enjoyable experience. 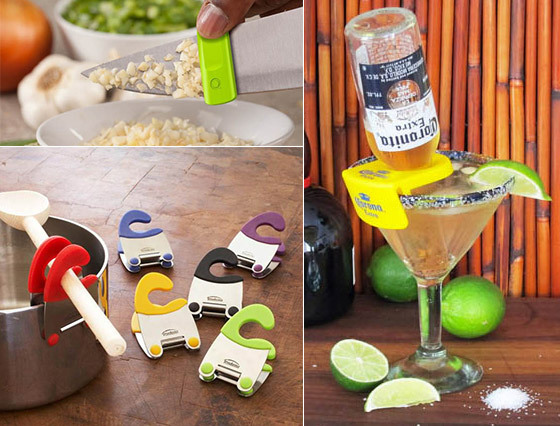 Take a look at the 11 Creative Clipable / Attactable Kitchen Gadgets we rounded up here and hope you find these little tools helpful. 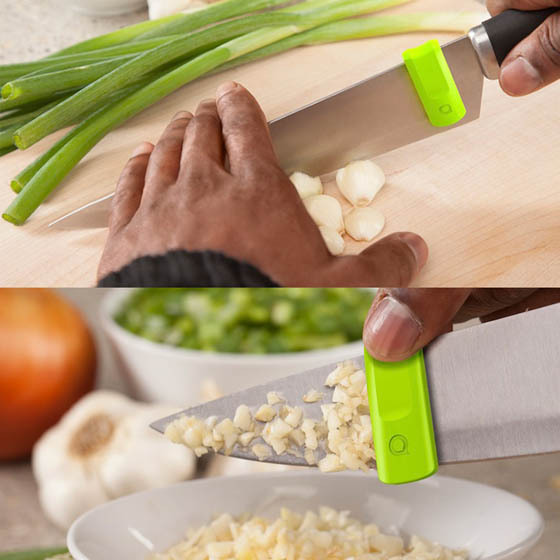 Glide is a nifty little tool designed to solve this problem for good, keeping a chef’s fingers safe from slicing, along with the stench of garlic or onion. 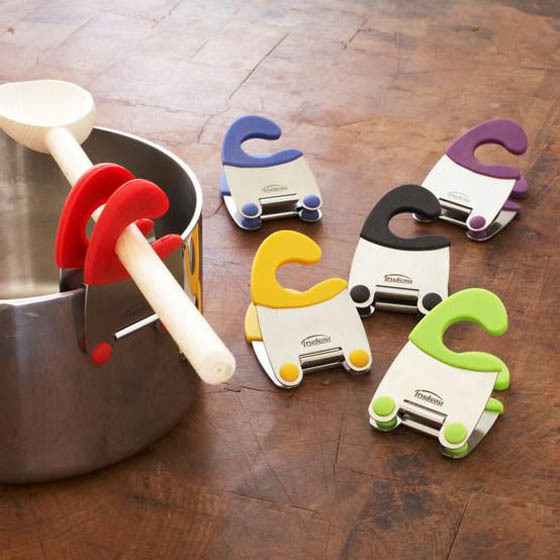 This clever gadget transforms virtually any pot or pan into a strainer. Drain pastas, veggies, meat and more without the hassle of pulling out a bulky colander. 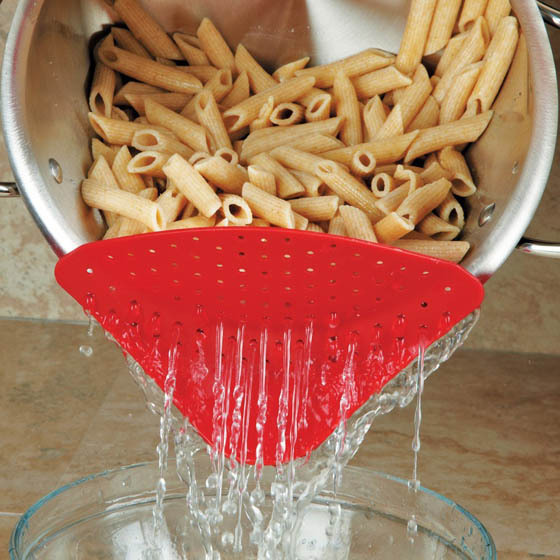 Easy-to-attach strainer clips securely to the side of the pot or pan and stays in place while draining. Fits most pots and pans. Manufacturer: Chef’s Planet. Material: Stainless steel, silicone and ABS plastic. This set includes 2 pieces for optimum extraction; unit for larger fruits like oranges and grapefruits; unit for smaller fruit like limes and tangerines. Simply cut a small piece of the peel off of the fruit that is slightly off center from the stem, screw the pointed threaded end down into the fruit, squeeze the fruit gently to fill the sprayers filter and press the sprayer head to release the mist of juice. 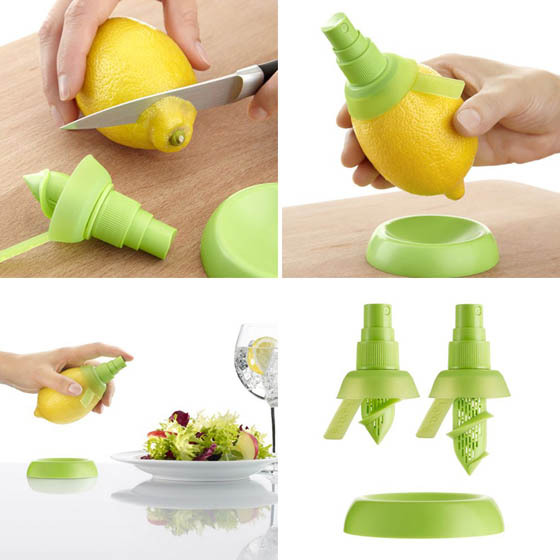 The citrus sprayer is dishwasher safe, however, it is important to wash it thoroughly to remove all pulp from both the filter and sprayer as this could impair proper functioning of the citrus sprayer. For those short breaks: tea bags are practical when time is of the essence, but the disposal issue can sometimes be a pain. 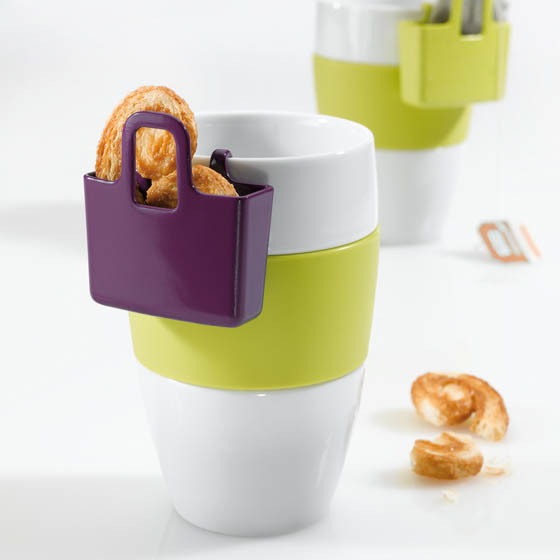 Now there’s a mini-bag that simply hooks onto the rim of the cup. Coffee drinkers, be comforted: the bag also doubles as a cookie holder. Milk does a body good but kids (and many adults) still reach for the “fun” and less healthy drinks. Make milk fun with our Milky Moo Milk Head! 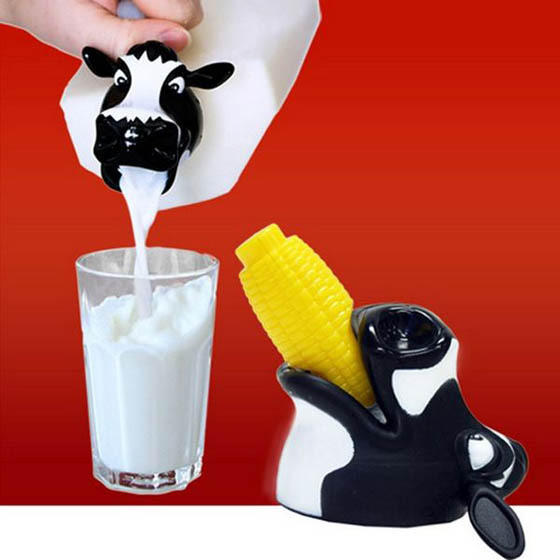 This hard plastic Milky Moo Milk Head is a universal cap size that fits most standard plastic milk jugs and measures 2.5 inches long x 2.5 inches wide x 2 inches deep. The included corn cob stopper measures 2.25 inches long x 0.75 inches wide x 0.75 inches deep. Bright little dip clips secure to any plate’s rim, holding salsa, guacamole, dips and condiments. 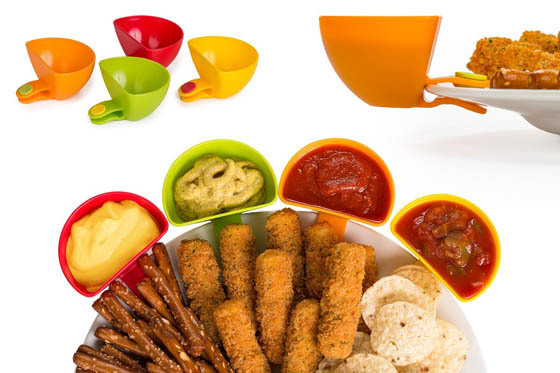 Dipping cups prevent your entire meal from “swimming” in sauce! Set of 4. 3″ long x 2″ wide x 1 5/8″ high. 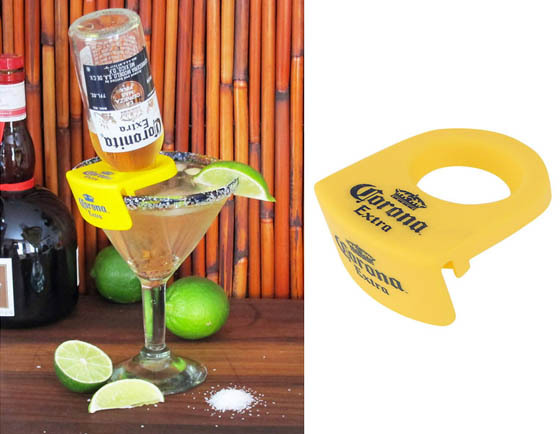 When you invert a little 7oz Corona beer bottle into a margarita, you get a CoronaRita like the ones at the Chili’s restaurants, but now you can make them for yourself at your own fiesta with these cool new CoronaRita Drink Clips. For use with margarita glasses only. The clip slides onto a plate and supports a wine glass. Each brushed clip has a rubberized inner surface to firmly grip the plate. 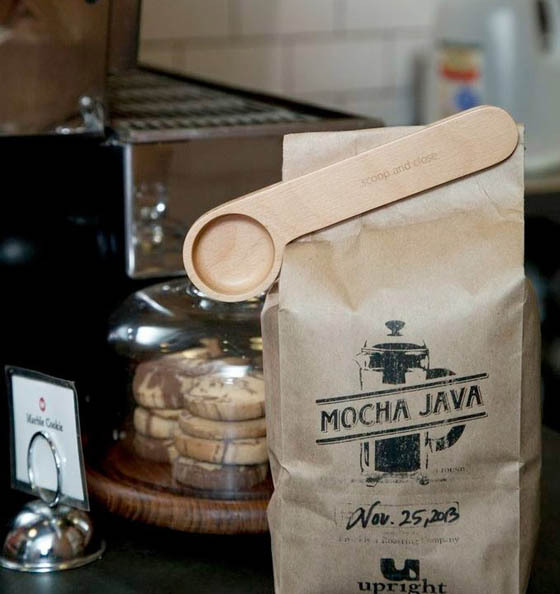 Scoop the right amount of caffeine everytime you need an energy booster using the Wood Cafe Clip by Kikkerland. It also doubles its usage by having a bag clip so that you get to keep your coffee stored safe and taste perfect at the same time. Made out of wood, the scooper can hold upto 10 grams of coffee each time which is just about the standard measurement for one steaming cup. Clips to side of sauce pan to hold utensil. Silicone feet are safe for non- stick pans. Silicone loop holds utensil without transferring heat. 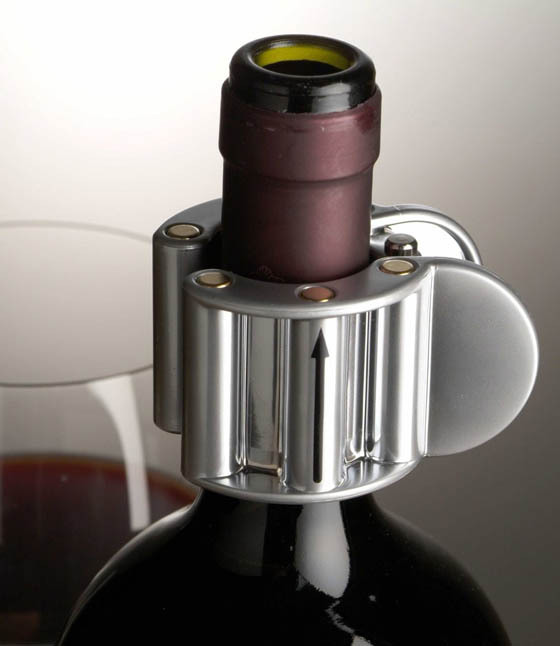 The Wine Clip uses principles of magnetics to improve the taste of wine as it is being poured out of the bottle. The effect is instantaneous, and has been found by many wine professionals to result in a genuine improvement in flavor and mouthfeel, especially when used on red wines. Attach The Wine Clip before pouring and your wine will taste smoother, more refined and infinitely satisfying.